Ventura Boulevard in Sherman Oaks, Los Angeles, May 2002. Photo by Reed Saxon/Associated Press. Will Los Angeles finally admit it’s a metropolis? And if so, what kind of metropolis does it want to be? That may seem a strange question, given the size of the L.A. region. But Los Angeles is of at least two minds. Yes, we’re home to world class universities, two pro football teams, the nation’s largest port complex by volume, the third-busiest airport in the U.S., more manufacturing than any other American city, and we’re bidding to host the Olympic Games for the third time. 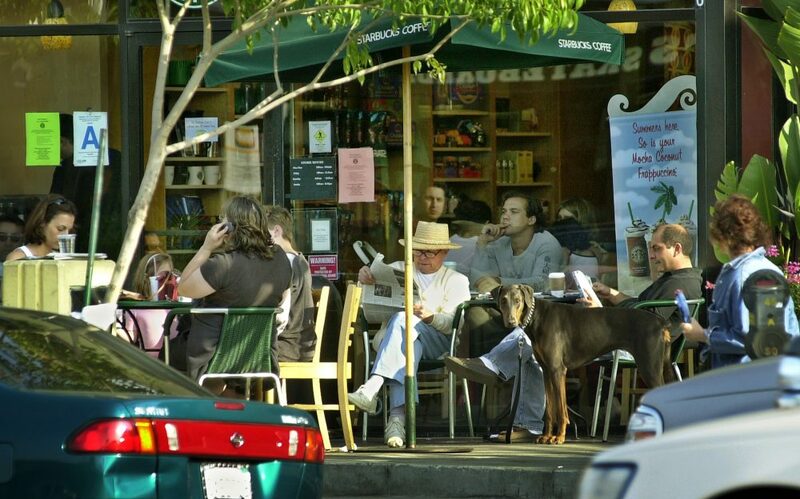 But many people in L.A. also expect the city to be as open and livable as any suburb. How we Angelenos see our city, and what we want for its future, is coming to a head not in a pitched street battle out of West Side Story, but at the ballot box. On March 7, Los Angeles voters will consider Measure S, an anti-development ballot measure that proposes to put a moratorium on certain types of building projects for two years. Many of the measure’s details address rather arcane urban planning codes that are admittedly outdated. But the campaign for Measure S has secured a base of support by tapping into a sentiment closely held by older residents, suburban dwellers within in the city limits, and NIMBY (“Not In My Backyard”) constituencies that Los Angeles is changing too rapidly into a dense, mega-city. As Los Angeles residents experience record-high rental rates and property values, developers are constructing larger infill projects, building multi-story apartment complexes akin to more traditional urban forms. The way Measure S supporters see it, these denser developments create more traffic, change the character of neighborhoods, and create more luxury housing at the expense of more affordable housing in older, smaller complexes. In short, L.A. is becoming too much of a metropolis. But the coalition opposing Measure S—developers, businesses, affordable housing advocates, urban living enthusiasts, and most of the political establishment—have a fundamental disagreement with the basis for Measure S. These opponents say L.A. must preserve any and all avenues for construction of schools, hospitals—and especially scarce housing. Cutting off the supply of housing with overly restrictive regulations in the midst of a well-documented housing shortage is a prescription for land use malpractice. Without needed supply, rents and property values increase to match housing demand. It’s a simple argument, which also happens to make tremendous sense. Maybe the answer is even simpler than we wish to acknowledge: We’re not just metropolitan; we’re a metropolis. We just need to be a better one. Reality, if not perception, is with the opponents. Angelenos don’t realize it, but L.A. is already the densest urbanized area in the nation, with some 7,000 people per square mile. (New York is in third place, at a mere 5,319 people per square mile.) But the enormous growth of the suburbs in post-WWII Los Angeles gave Southern California an ethos that’s been hard to shake, even in the 21st century: The relic of a notion that we’re entitled to two cars in every driveway and a Weber grill on every backyard patio. Los Angeles is of at least two minds. Yes, we’re home to world class universities, two pro football teams, the nation’s largest port complex by volume, the third-busiest airport in the U.S. … But many people in L.A. also expect the city to be as open and livable as any suburb. Of course, L.A. has evolved into a metropolis as it has grown in population, driven by domestic migration, immigration from Asia and the Americas, and the simple math of the birthrate for Angelenos already here. But it can be hard to understand that because, as Reyner Banham wrote in his 44-year-old book, Los Angeles: The Architecture of Four Ecologies, the city is so multifaceted. Banham saw his four ecologies—the hills, the flatlands of the coastal plain, the beaches, and the freeways—as being so disparate that there was no shared narrative about the place. “Los Angeles does not get the attention it deserves,” Banham wrote. “It gets attention, but it’s like the attention that Sodom and Gomorrah have received, primarily a reflection of other people’s bad consciences.” Could it be we have finally matured as a city so that we are no longer seeing reflections, but a new urban reality? Today, it can feel as if different generations are living in very different L.A.s. While older residents cling to suburban neighborhoods, young people are living more urbanized lives, with Lyft and Uber and Metro trains coexisting with fusion restaurants and food trucks. Downtown Los Angeles loft-dwellers—a species that would have been unthinkable 20 years ago—walk their dogs, zip around via our expanding transit system, and enjoy a thriving culinary scene that’s nationally—and internationally—recognized as one of the most vibrant anywhere. I’m not young anymore, but I appreciate how this newer metropolis allows me to live in Valley Village, an increasingly urban environment near Studio City and North Hollywood that is less dependent on the automobile, and that has more to offer as a result. From my San Fernando Valley neighborhood, I take the Metro Red Line to my office in downtown Los Angeles’ Historic Core, getting to work faster than I did driving surface streets from where I previously lived in the Miracle Mile. I walk to my local grocery store, the dry cleaners, and my daughter’s elementary school. To be sure, my neighborhood has all the plagues that Measure S supporters worry about: traffic, police and ambulance sirens, and, yes, noise from construction sites building much-needed housing. But on the whole, I feel fortunate to live in a place where I’m not stuck in the backyard. I feel connected to the city, literally and figuratively. For me, that’s progress. And the moment we realize that we are a metropolis, restrictions like those proposed by Measure S will be seen as a relic, too. David Gershwin is a Los Angeles-based public affairs consultant, Zócalo Public Square board member, and teaching fellow at UCLA Anderson School of Business.